Titan Motorsports has been the industry leader in race 2JZ engines for over a decade. We started our 2JZ engine program in 2000 and began to dominate the NHRA SC Street Tire class with our MKIV Supra, but we never imagined we would have developed a 2JZ engine to break the 5 second barrier at over 250mph. Throughout our journey into the record books we’ve experienced our fair share of failures and painstakingly developed solutions to resolve weak links. Our team leads a relentless quest to engineer the best 2JZ on the planet. The result of dedication to perfection and 2JZ drag racing supremacy has led us to this moment. 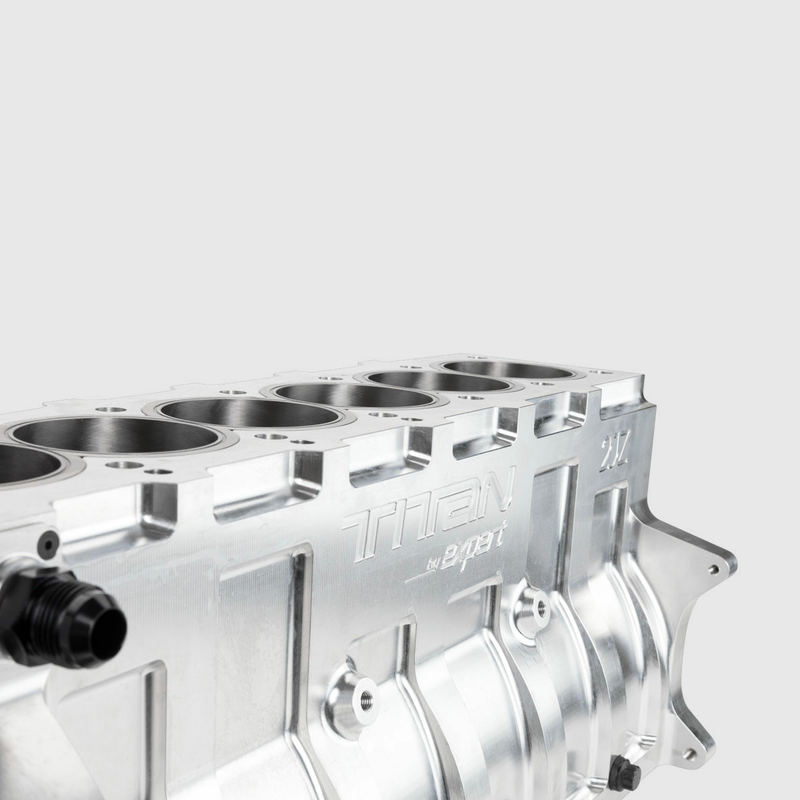 The release of over a decade of development and what we consider the foundation for the ultimate race 2JZ, the Titan Motorsports Billet Race 2JZ Block. 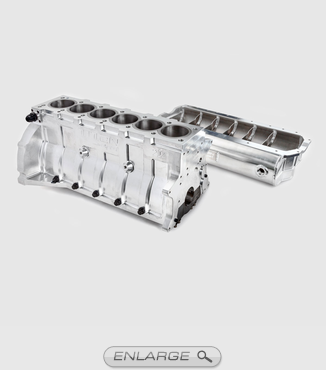 Starting with our class leading factory iron block 2JZ race program, which already put out over 2,000HP, we partnered with Expert Racing to develop the next step. A team of engineers used advanced computer simulations to review weak points in the way the factory block dealt with the extreme loads being sent throughout its structure. 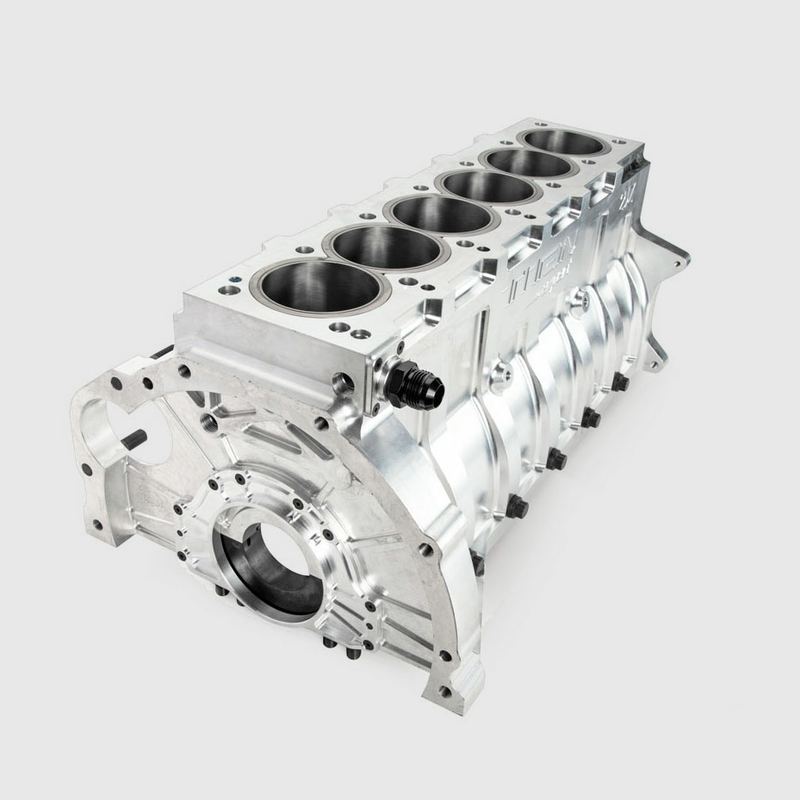 This information allowed us to engineer the Titan Motorsports Billet 2JZ to the next level. Utilizing computer simulation to test multiple iterations, we were able to create the final CNC produced block. 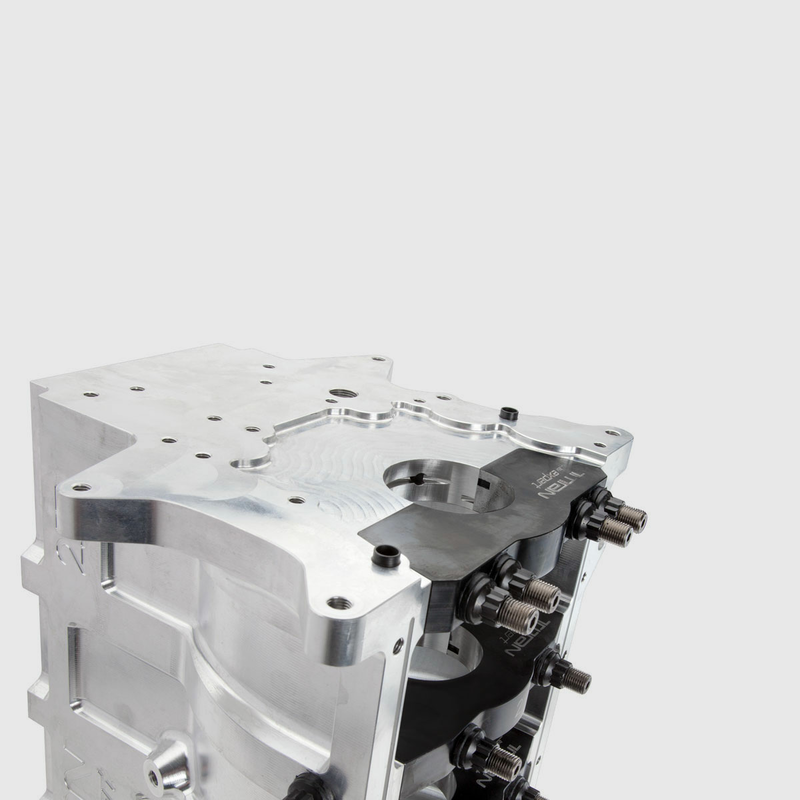 The resulting block is stronger than the OEM Toyota version it replaces, and saves more than 50lbs in the process. For maximum bearing life, the 7 main caps were designed out of forged steel with cross bolted main caps designed to handle in excess of 4,000HP without sacrificing serviceability. The cylinders feature custom-designed Darton© sleeves consisting of extra thick walls meant to withstand extreme cylinder pressures while also allowing for a user configurable displacement up to 3.5 liters. 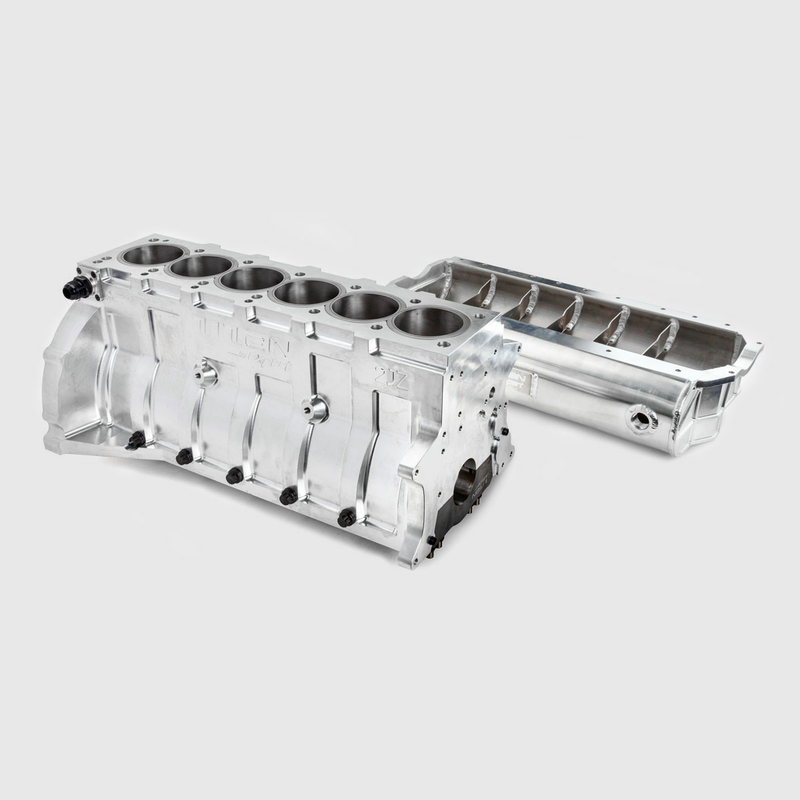 All hardware has been produced by industry leader ARP, bespoke to this engine package, including 9/16” to 1/2" custom head studs to the dual L19 main studs with cross bolt mains. We’ve also included an optimized Dry Sump Oil Pan, designed specifically for this block, to aid in oil scavenging and increased service life. For the past 15 years we’ve taken great pride in our racing accomplishments here at Titan Motorsports, pushing the limits of the 2JZ and helping cement its legendary status. This newly designed Titan Billet 2JZ has raised the bar during the past 2 years and powered many of the world’s quickest and fastest drag cars including EKanoo Racing, La Criatura Racing, Blue Destiny and many more. This block was designed as a race only unit with no water jackets or provisions included to allow additional mass in key areas for strength. At this time, we have no plans for production of a street version with these provisions as the factory unit has shown to be more than adequate. Confident we’ve produced the meanest 2JZ available on the planet today, confirmed by testing on the track and off, we’re happy to release this product to the rest of the world. We can’t wait to see how much further our customers can push the envelope in 2JZ drag racing.